THERM-O-TYPE is a family owned business that was founded in 1977. THERM-O-TYPE Corporation designs and manufactures a unique line of innovative, reliable, high quality print finishing and enhancement technologies. Current THERM-O-TYPE products include; sheetfed foil stamping, embossing and die cutting presses, inline die cut waste stripping attachments, foil fusers, foil cutters, cutter/slitter/creaser models, rotary die cutters, right angle slitters, handfed thermography machines and business card slitters. THERM-O-TYPE also sells thermography powders, glitters, fusing foils and films, makeready supplies, watermark chemistry, business card boxes, letterpress tooling and HSFF (high speed foil fusing) supplies. History of THERM-O-TYPE began with thermography. Ted and Joyce Van Pelt, the founders of THERM-O-TYPE, owned a successful commercial printing plant in Venice Florida. They produced thermography for years by hand “dusting” printed sheets and running them through a simple conveyor with a heat tunnel. They saw the excellent profit potential thermography could provide to commercial printers. Unfortunately, there were two problems. Producing thermography with handfed equipment was too slow and labor intensive for most applications. Existing automatic thermography machines were up to 20’ long, and used gas heaters that needed to be vented through the roof. This equipment was too large, immobile and generated too much heat to be practical for small and medium size plants. They committed themselves to develop an automatic thermography machine that would be suitable for use in commercial printing plants. The result of this development effort was the revolutionary Model 500 automatic thermography machine. The Model 500 was just over eight feet long and featured a hinged infeed conveyor that could be configured to run inline with most small offset presses, an effective powder application/recovery system, efficient electric heaters (which did not require venting), a vacuum holddown to control paper curl and a high velocity cooler. The Model 500 was all electric, using commonly available power, and, mounted on casters, could easily be moved around even small printing plants. The Model 500 (along with the Model 100 and 200 handfed thermography models) were a huge success, so much so, that Ted and Joyce sold their printing plant to focus full time on developing and producing printing equipment. Operating as a family business, THERM-O-TYPE has continued their commitment to developing and producing innovative, high quality equipment technologies for the printing industry. 2017 marks THERM-O-TYPE’s 40th anniversary of service to the printing industry and commitment to our customers. The Model 500 automatic thermography machine. The Model 100 and 200 handfed thermography machines. The 400, 501 and 600 automatic thermography models. The patented, SL-6 and SL-12 scissor cut, business card slitters. The patented, 400 Series automatic thermography machines. The patented, GLS Series scissor cut business card slitters. The Quad-12 gutter cut business card slitters. The CF-2000 pack-to-pack foil stamping/embossing/die cutting press. The patented, TOT pack-to-pack feeder/refolder. The SF-2000 sheetfed foil stamping/embossing/die cutting press. The Tri-Max pack-to-pack MICR encoder. The patented, MP series, scissor cut business card slitters. The patented, Green Machine series automatic thermography machine models. The patented, Aegis chemically applied watermark system. The Super Quad-12 gutter cut slitter. The SFM and SFX foil stamping/embossing/die cutting presses. The Automatic Foil-Tech foil fuser. The ThermoTech 12 and 15 automatic thermography machine models. The Manual Foil-Tech foil fuser. The NSF A3+ foil stamping/embossing/die cutting press. The Super Quad-20 gutter cut slitting/scoring/perforating machine. The FT-10 handfed foil fuser. The NSF A3Pro foil stamping/embossing/die cutting press. The HSFF (high speed foil fusing) process. The FT-15 handfed foil fuser. The NSF Elite foil stamping/embossing/die cutting press. The RAS-mc right angle slitter. The NSF Excel foil stamping/embossing/die cutting press. The RDC-Flex rotary die cutter. The NSF Ultra, large format, foil stamping/embossing/die cutting press. The Inline Waste Stripping Attachments for the NSF Elite and Excel. THERM-O-TYPE manufactured products are built in Nokomis, Florida and sold to printers around the world. 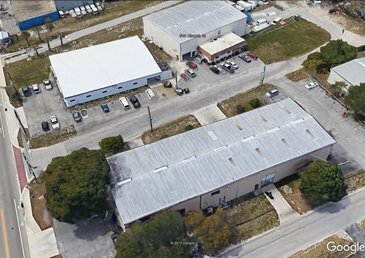 Our vertically integrated factory includes product design and drafting, state of the art CNC machining and fabricating capabilities, painting, circuit board design, assembly, repair and testing, machine wiring, software development, machine assembly, quality control, product testing and training facilities. THERM-O-TYPE employees are skilled, experienced and dedicated to developing and producing innovative, high quality and dependable technologies for the printing industry. With over forty years of proven performance, THERM-O-TYPE is committed to serving and supporting each of our customers.